My sister-in-law made these cookies with the Namaste gluten free flour blend (our local Costco sells a large bag for only $9). She really liked the way they turned out! Melt the chocolate and butter in a double boiler, stirring often. Set aside to cool slightly. In a bowl, combine flour, cocoa, baking powder, and salt. In a large bowl combine eggs, granulated sugar and vanilla, beat with wisk until light in color and thick (about 3 minutes). Stir in melted chocolate mixture with a wooden spoon until blended. Add dry ingredients until incorporated. Cover bowl with plastic wrap and refrigerate for about 2 hours. Position rack in the middle of the oven and preheat to 325 degrees. 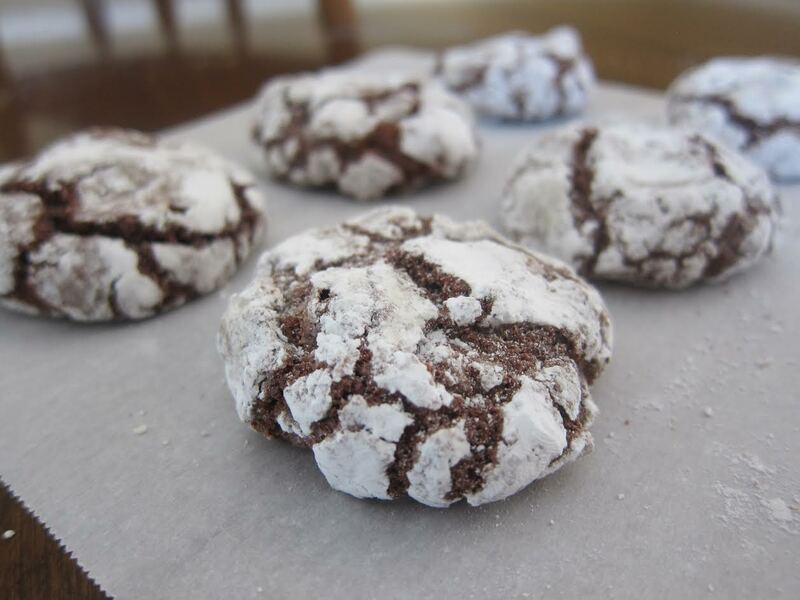 Form cookies into 1 1/2″ balls and then roll them in confectioners sugar. Place on cookie sheets and bake about 13 minutes – until the tops are puffed and crinkled and feel firm when lightly touched. Let cool on sheet for 5 minutes and transfer to wire cooling rack.